Home > Products > Ten Strawberry Street Monaco Beige/Gold Glass Charger Plate 13-1/4"
Impress customers by presenting salads, appetizers, and entrees on the Ten Strawberry Street Monaco Beige/Gold Glass Charger Plate 13-1/4". 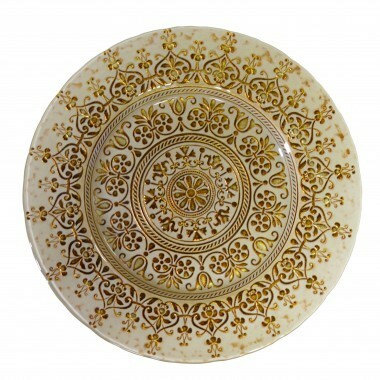 Oozing with European charm, this antique-style charger plate features intricate gold detailing set on a classic beige background. Made from high quality glass, this charger plate perfectly combines beauty and exceptional durability, making it ideal for high-end venues. This charger plate accommodates any size plate and pairs well with beige dinnerware.